From more that 5000 artist names for whom we have sculpture listed among their mediums, how did we extract these 100 names for special attention? Well, many of them rose easily to the top when the list was sorted for highest prices at auction for sculpture from 1989, and sorted for the most reference books from our library of 8000, linked to their names. The following, in consecutive order, were the top five in the auction sort: Jasper Johns, Bruce Nauman, Alexander Calder, Jeff Koons, and Frederic Remington. 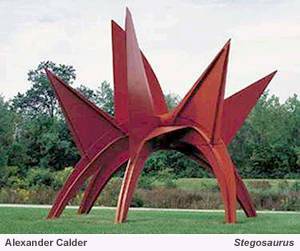 The top five with the strongest number of book links were Remington, Johns, Calder, Frank Stella, and Claes Oldenburg. Of course, the first challenge when tackling this subject of leading American sculptors is to arrive at a definition of "what is sculpture?" On that one, we take the easy way out and include in our search everything that is three dimensional, (carved, modeled, or assembled). This criteria makes a big umbrella for a range of work including marble, neo-classical figures by Thomas Crawford, depictions in metal of crushed automobile parts by John Chamberlain, urinals by Man Ray, and disembodied, super-realistic human limbs by Robert Gober. It is all here for your consideration, and what a remarkable "assemblage" it is when you consider the diversity in ages, which range from William Rush, born 1756, to Keith Haring, born 1958. There is also a big span in geographical locations, styles, and subject matter. Many of the subjects are whimsical or humorous such as Barry Flanagan’s dancing rabbits, Duane Hanson’s life-like everyday people, and Jeff Koon’s and Claes Oldenburg’s larger-than life Pop figures. Geographically New York (is that a surprise?) dominates. California has five names: Robert Arneson, Mike Kelley, Richard Serra, and Peter Voulkos; New Mexico holds Larry Bell, Glenna Goodacre, Allan Houser, and Bruce Nauman, and Joe Beeler and James Turrell live in Arizona---can you imagine art expression more polarized than between those two? 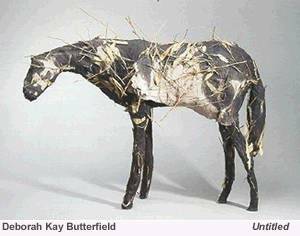 Harry Jackson is from Wyoming, and Charles Russell and Deborah Butterfield, from Montana, represent the northwest. Duane Hanson from Florida and Robert Smithson from Texas represent the South. And there are those northern "southerners" from that border state of Missouri, John Rogers and Ernest Trova. Some of the names are included for their historical importance as well as for their strong reputations in the market and literature. Gertrude Whitney, Erastus Palmer, and Daniel Chester French played key roles in sculpture a generation or more ago. Whitney was one of the key figures who ushered in modernism, both through her artwork and her financial ability to support modern artists. Daniel Chester French represented the Beaux Arts tradition of classically trained sculptors, and in that style, created many of this country’s most famous historical monuments including the figure of Abraham Lincoln at the Lincoln Memorial in Washington DC. Fifteen women are among our Notable 100 Sculptors, the most-recent born being Deborah Butterfield, 1949, and the oldest-born, Harriet Hosmer, 1830. Eight of these female sculptors have or had a traditional approach or realist style including Gertrude Whitney, Anna Huntington, and Harriet Hosmer, In the highest dollar-at-auction category for their sculpture, Eva Hesse takes first-place prize among these women, followed by Louise Bourgeois, Harriet Frishmuth, Louise Nevelson, and Glenna Goodacre. As in the top five of male sculptors, western art holds a place with Goodacre being the representative. Two of the top five women have realist styles: Goodacre and Frishmuth. From this list of "notables," what sort of conclusions can be drawn about the type of sculpture most popular with the American public? My assertion is that anyone treading into that territory with the aim of finding something definitive had best learn to be very patient and open minded. 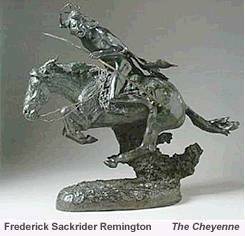 One safe conclusion is that in spite of Frederic Remington being near the top in prices and the top in literature, a majority of the top high-dollar and literature-strength names worked in modernist or abstract styles.